Cyrus Phono Signature review | What Hi-Fi? Let’s face it, the true hi-fi enthusiast can’t help but tweak. After all, why wouldn’t you want to get the very best from every part of your system? The arrival of Cyrus’s Phono Signature makes things a whole lot easier. This premium phono stage lets the user fine-tune cartridge matching from the comfort of their favourite listening position – something we haven’t come across before. Cartridges of all types need the partnering phono stage to have specific electrical input characteristics to transfer their delicate music signal properly. We’re talking about tiny fractions of a volt here, so we really do mean delicate. 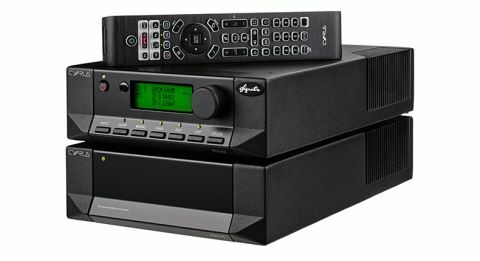 Moving magnet designs tend to have pretty fixed electrical parameters so, as far as setting values for gain and impedance are concerned, things are easy for phono stage designers. Moving coil cartridges are another story, as their output tends to be much lower and more varied. A range of gain settings is needed, and there’s no standardisation as far as capacitance and resistance are concerned either. If these conditions aren’t met, you won’t hear what these components can do. Traditionally, premium phono stages have allowed users to adjust these parameters, usually through a series of small DIP switches on the back panel or hidden inside. This usually makes optimisation a drawn out affair, but not with this Cyrus phono stage. Fine-tuning the sound is a breeze and any changes can be done by remote in a couple of seconds, without moving from the sweet spot. The remote is one of the company’s usual system affairs, so only a handful of buttons are actually of use. It’s a shame they’re not properly marked for the task either. Cyrus should do better here. The Phono Signature has four inputs, each of which can be optimised individually. The gain range is 40dB right up to 70dB (to cope with really low output moving coils). Resistance and capacitance can be adjusted through an equally wide range of adjustments. A choice of both balanced XLR and single-ended line level outputs means that this unit will slot into most systems with ease. As usual for the brand, the Phono Signature is upgradable. You can add the updated version of the company’s outboard power supply, now called the PSX-R2, to improve performance. This is a hefty, fully-regulated 300W DC supply designed to deliver highly stable, low-noise power to the Phono Signature’s sensitive internal circuitry. Considering the amount of amplification any phono stage has to do – many times more than any pre or power amp – a pure power feed is essential for a good performance. Overall build and finish are just as we’ve come to expect from Cyrus. The Phono Signature is built into one of the company’s traditional die-cast, half-width casings. The finish is as neat as ever, though aspects such as the display (which has poor contrast off axis) and the vague feel of the control buttons betray the fact that the design is around two decades old. Anyone considering spending this kind of money on a phono stage needs to have a suitably capable turntable. We used our reference Clearaudio Innovation package, which includes the Stradivari V2 moving coil. This is a well-engineered cartridge with an analytical presentation and an output that’s on the middle-to-low side of the Moving Coil scale. The Cyrus Phono Signature copes admirably. We start with the phono stage without the PSX-R2 connected. Once run-in, it delivers a wonderfully clean and crisp sound. Previously, Cyrus’s sonic signature was a little light and bright, trading sonic authority for agility and outright resolution. Things have changed in recent years with the company’s products showing less of a tendency to compromise solidity and balance. So it proves with this phono stage. We play Bob Marley’s Exodus and it doesn’t take long to realise that the Phono Signature has some serious talent. This newly found sonic substance is as welcome as it is obvious. The song’s insistent low-end has good weight and plenty of punch, which gives the presentation a firm foundation to work from. The lows don’t dominate though, and still maintain Cyrus’s traditional values of precision and speed. Move up the frequency range and you’ll find fluid and articulate vocals and a crisp top end. It’s a lively, well-organised sound packed full of texture and insight. Next up is an old favourite, Kind Of Blue by Miles Davis. Here the Cyrus shows-off its excellent resolving powers and ability to render complex rhythms with skill. It conveys the momentum of So What well, tying together the various instrumental strands superbly. Tonally, things are convincing and full bodied without edging towards overt richness or excess weight. It’s all refined and smooth, yet has plenty of bite when required. At this point it’s time to plug in the PSX-R2, and we realise there’s no going back. Make no mistake, the Phono Signature is certainly one of the best we’ve heard at the price, but adding the PSX-R2 takes sound quality to another plane altogether. The most obvious change is that the scale of the presentation gets much bigger and the bass gains even more authority. Listen longer and you’ll find improvements across the board from extra layers of fine detail and improved refinement to a more fluid handling of dynamics, both large and small scale. What does this mean for the music? Listening to Orff’s Carmina Burana, the Phono Signature/PSX-R2 transports you into the recording venue. Close your eyes and it’s easy to deduce the size of the auditorium and the precise positions of the performers in the beautifully layered sound stage. There’s an impressive intensity in the choir’s vocals as they soar with freedom. This piece has plenty of demanding moments where instruments and voices just explode in what can easily become a mess of noise. Not through this Cyrus. It’s neat, organised and impressively composed, delivering each dynamic thrust of this complex arrangement with ease. If you want to analyse the recording it’s all here, laid bare, however if you want to sit back and enjoy, the Phono Signature/PSX-R2 combo is more than happy to oblige – its insightful delivery squeezing the last drop of emotion from the music. The Cyrus brand has been built on a long traditional of excellent CD players and amplifiers. Vinyl replay has never been a major part of its output, and we’ve found past phono stages good rather than great. This Phono Signature/PSX-R2 combination changes that. It is wonderfully flexible and the ability to fine-tune cartridge loading with the remote works superbly. Most of all we just love the way it sounds. If you’ve already got a suitably talented turntable and really want to hear how good it is, buy this.